The elongated square gyrobicupola is the 37th Johnson solid (hence, the moniker J37), having 18 square faces and 8 triangular faces. 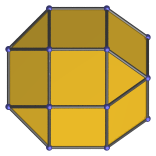 It is also known as the gyrate rhombicuboctahedron, or pseudo-rhombicuboctahedron, because it has exactly the same faces as the rhombicuboctahedron and the same configuration of faces (3 squares and a triangle) around each vertex, but is not uniform because its vertices are not transitive. 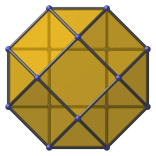 It may be thought of as a rhombicuboctahedron, treated as an elongated square bicupola, in which a square cupola is rotated by 45°. Due to the non-transitivity of its vertices, the elongated square gyrobicupola only has one axis of symmetry, passing through the two opposite square faces that are rotated 45° relative to each other. Projection parallel to axis of symmetry. Projection perpendicular to axis of symmetry. 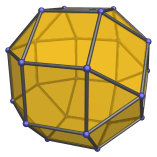 These coordinates are obtained from the rhombicuboctahedron by replacing the 4 vertices of an axial square face with the 4 vertices of a rotated square.